Click to enlarge this image and each image below. Which three of these buildings survive? 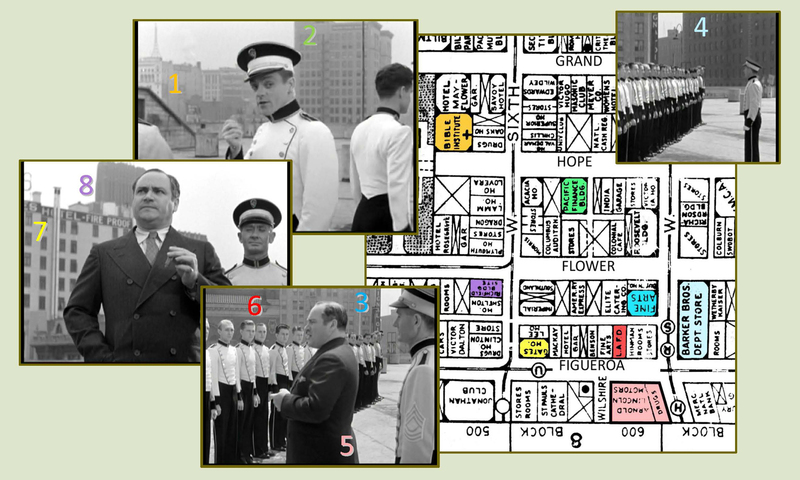 Eight downtown Los Angeles landmarks appear behind James Cagney during the opening scenes of Lady Killer (1933), yet only three survive to tell their tale. 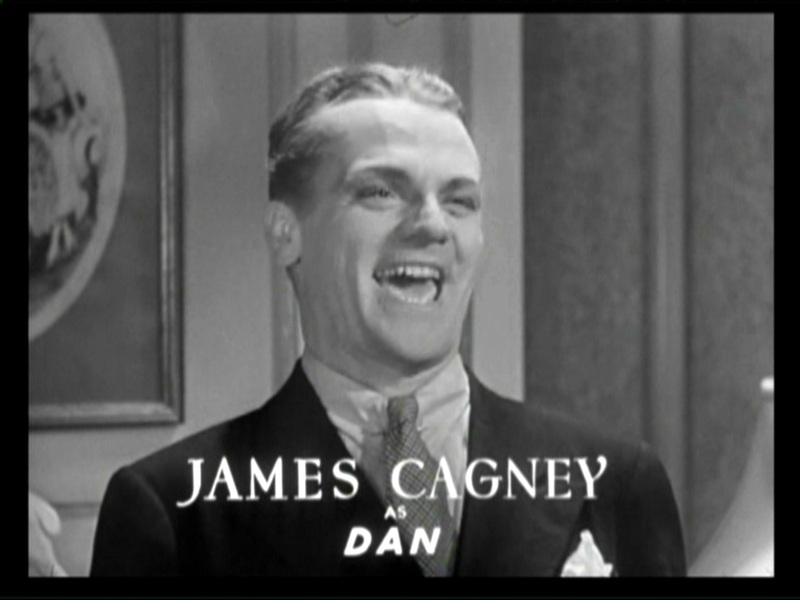 In this delightful pre-Code comedy/drama, Cagney plays Dan Quigley, a wise-cracking New York movie theater usher who falls in with a gang of crooks, and then flees to Los Angeles seeking a new life. Once there he stumbles into the movies and becomes an unlikely star, prompting the old gang to seek him out for blackmail and revenge. The movie opens with dozens of uniformed Warner Bros. movie theater ushers lining up for inspection on an open downtown rooftop. Jimmy arrives late as usual, but charms his way out of trouble. Who’s late for roll call? 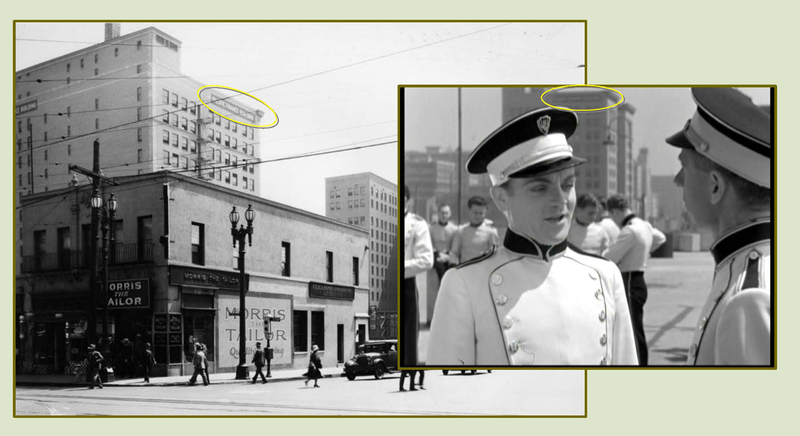 Cagney (arrow) and the WB ushers on the roof of the former Arnold Building auto dealership and parking garage at 7th, Figueroa, and Wilshire, (5) above on the map. LAPL. The movie begins with the ushers lining up for inspection. The existing Barker Brothers Building, 818 W. 7th Street, (4) above, appears to the right. LAPL. The Fine Arts Building, 811 W. 7th Street, (3) above, also known as the Signal Oil Building, also appears. LAPL. Cagney runs past Los Angeles Fire Department Engine Co. No. 28, at 644 S. Figueroa, (6) above, now a restaurant. LOC. When Jimmy dashes onto the roof from the stairwell shed, the former Bible Institute Building at 6th and Hope Street, (1) above, appears at back. LAPL. The building later installed a pair of large neon “JESUS SAVES” rooftop signs that became a downtown landmark. The orange oval marks the Bible Institute wall sign – the yellow oval marks the Pacific Finance Building wall sign discussed below. The side of the former Pacific Finance Building, (2) above, appears at back. 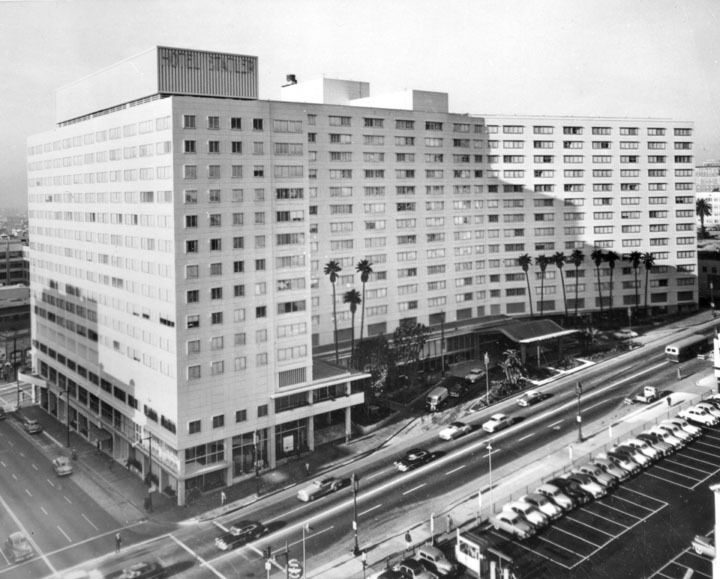 The building originally stood facing an alley that later became part of Wilshire Boulevard, when Wilshire was extended east from Figueroa to Grand during 1930-1931. The Pacific Finance Building was replaced by the 62 story First Interstate Bank Building, completed in 1973, and now called the Aon Center. LAPL. The former Gates Hotel at 6th and Figueroa, (7) above, and former Richfield Building at 6th and Flower, (8) above, appear at back. The yellow oval marks the same letter “S” on the GATES rooftop neon sign. The Richfield Building, clad in black and gold terra cotta tile, was recognized as one of the great Art Deco masterpieces of modern architecture, but was sadly demolished in 1969. LAPL. LAPL. This broad reverse view shows the stairwell shed on the roof of the Arnold Building garage (yellow box) from which Cagney emerges, as well as matching details on the back of the Gates Hotel (narrow yellow box). The red arrow marks the back of the LAFD Engine Co. No. 28 building, as it appears in the main photo, and the front as it appears in the movie. 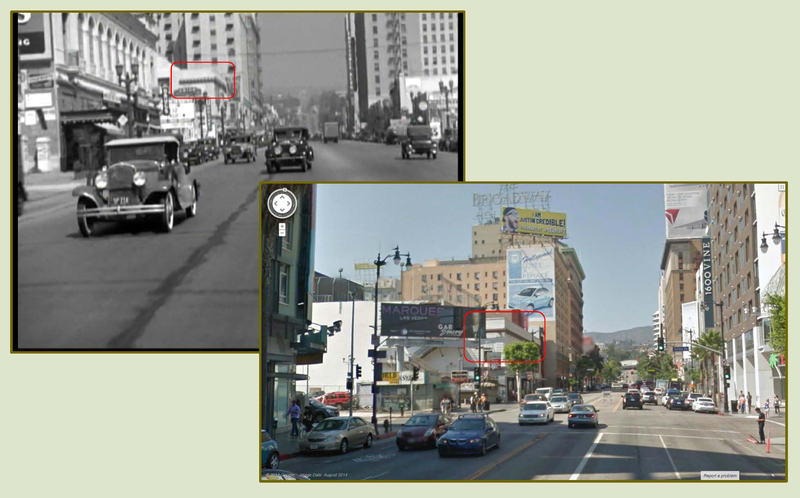 Directly above the red arrow stands the former St. Paul’s Cathedral that stood on Figueroa (1923-1980). LAPL. Click to enlarge. 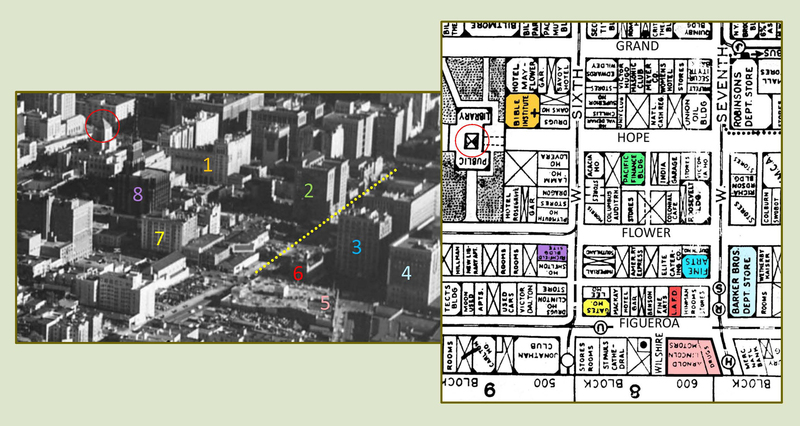 This later aerial view shows the various buildings in relation to the Arnold Building roof (5), and the tower of the Los Angeles Public Library Building (circle). Note on the circa 1928 map that Wilshire Boulevard, to the left of the pink Arnold Building, then terminated at Figueroa. The aerial photo shows Wilshire (dotted yellow line) extending three blocks further from Figueroa to Grand, as completed during 1930-1931. USC Digital Library. The Arnold Building was demolished to make way for the ultra-modern Statler Hilton Hotel that opened in 1952, at the time the largest hotel built in the US since the Waldorf Astoria in 1931. The massive hotel, once a downtown landmark, was recently obliterated to make way for the new 70 story Wilshire Grand Center currently under construction and set to open in 2017. You can read all about the Statler Hotel’s demise at Steve Vaught’s entertaining and informative Hollywood architecture blog Paradise Leased. 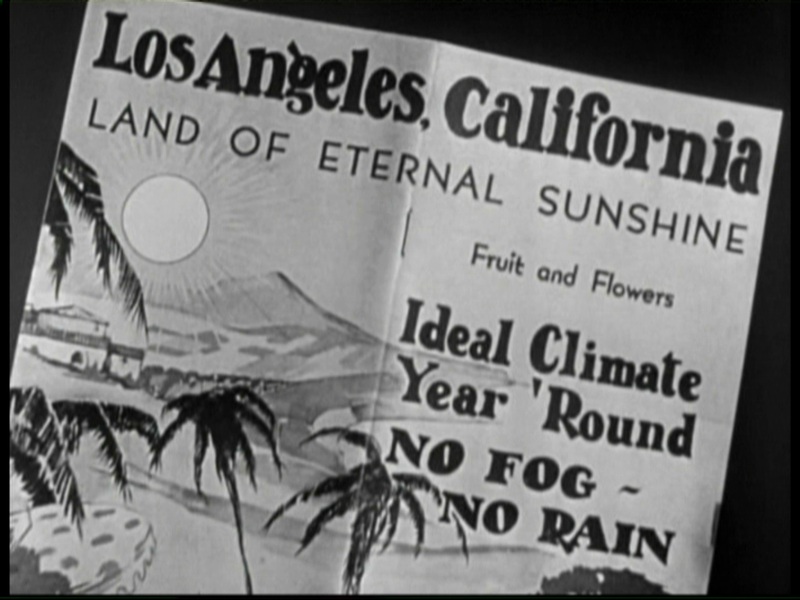 Jimmy and Mae Clark flee “New York” for sunny California, as touted by this brochure (right), only to arrive by train during a thunderstorm. The establishing shot of their arrival, below, shows the back of the Santa Fe Depot that was used perhaps more often than any other station as a filming location. Harold Lloyd used the same station for scenes from both Girl Shy (1924) and Movie Crazy (1932), while this post shows how the station appears with Max Linder and Laurel & Hardy. Jimmy arrives in “sunny California” at the rear of the Santa Fe Depot, a very popular place to film that appears in dozens and dozens of films. This post shows how Max Linder and Laurel and Hardy also filmed at the same depot. USC Digital Library. The gang fixes for Jimmy to be arrested on trumped up charges so they can follow and kill him after he is released from jail. Mae Clark posts Jimmy’s bail, and picks him up beside the Hall of Justice in downtown Los Angeles, the true setting where criminals were jailed at the time. Cagney’s car pulls away from the Hall of Justice, on the corner of Broadway and Temple, towards the south face of the Broadway Tunnel. Completed in 1925, the recently refurbished Hall of Justice building reopened in 2014 after being shuttered for decades. While the building looks good as new, the Broadway Tunnel and its supporting hill were removed in 1949. USC Digital Library. Despite initially being in on the plot to have Jimmy killed, Mae Clark warns him they are being followed, touching off a chase around Hollywood. The action skips to Hollywood. 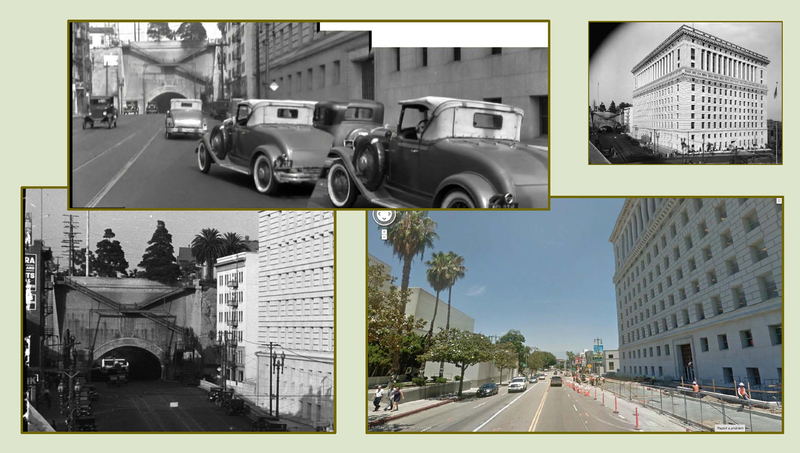 Cagney and Mae Clark are chased down Vine Street from Hollywood Boulevard past what is now the Montalban Theater located at 1615 Vine Street (red box). LAPL. A companion contemporary view looking north up Vine towards Hollywood Boulevard and the Montalban Theater (red box). 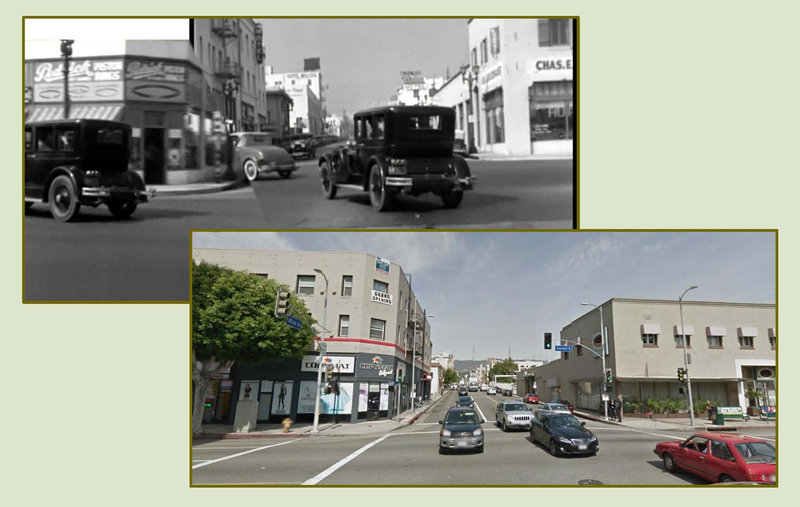 Next, the killers chase Cagney north up Wilcox, where he turns left, west, onto Sunset Blvd. 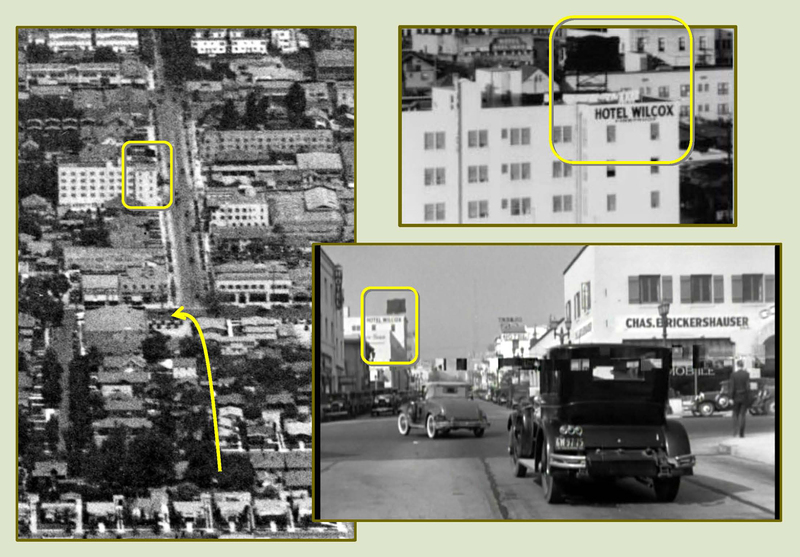 The extant Hotel Wilcox appears up the street in each image (yellow box). Notice that Wilcox was not yet a through street when this aerial view at left was taken in 1928. Marc Wanamaker – Bison Archives; USC Digital Library. Looking north up Wilcox from Sunset Boulevard today. The Hotel Wilcox is still standing up the street. 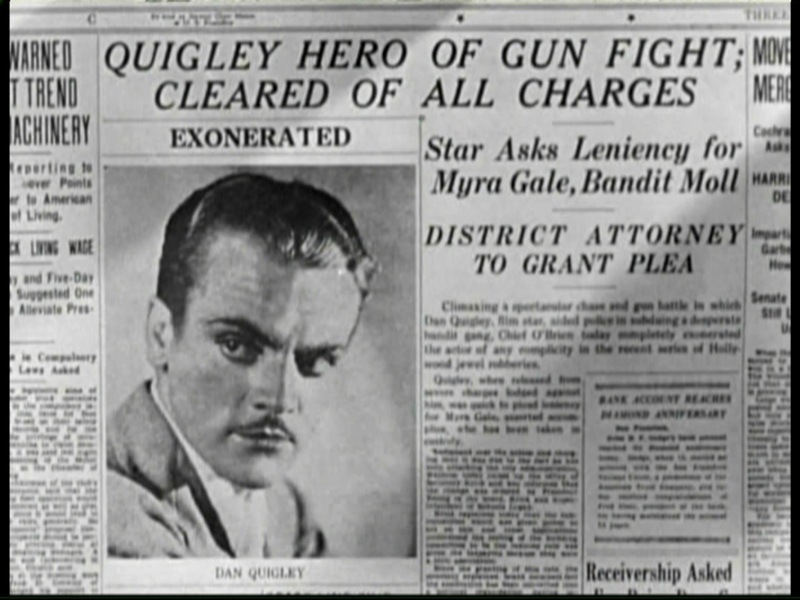 Following a prolonged chase and gun battle, the movie ends in true Hollywood fashion – the crooks are vanquished, Mae the gun moll is rehabilitated, and Jimmy resumes his film career and weds a movie star. Wrapping up, Harold Lloyd filmed a number of early street scenes in Hollywood for his thrill comedy short Never Weaken (1921). 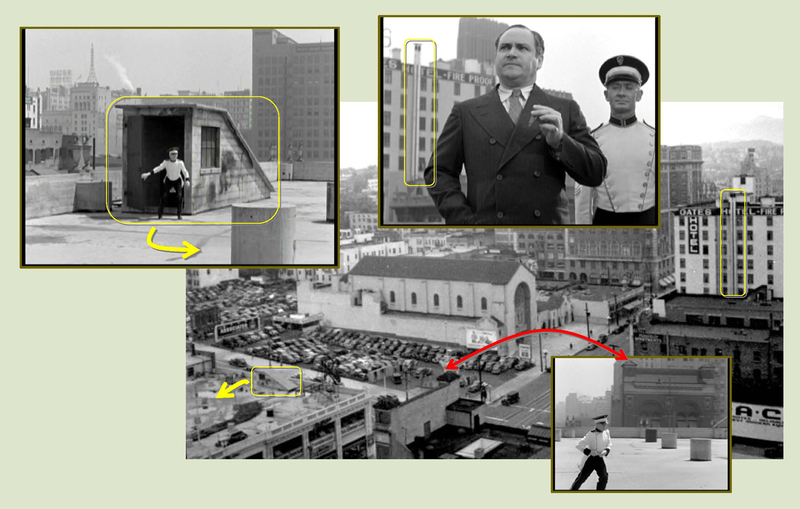 The isolated shot below, edited to match with those filmed in Hollywood, was for some reason also filmed in downtown beside the Arnold Building, the same spot where Cagney would film on the roof a dozen years later. 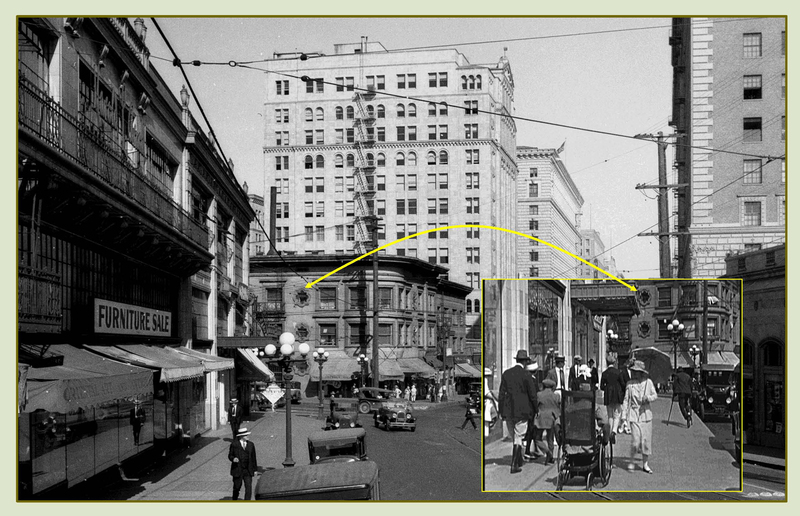 Looking east along 7th Street toward the corner of Figueroa, with a matching view (inset) from Harold Lloyd’s Never Weaken. The Arnold Building, where Cagney filmed on the roof, stands to the left. The prominent Fine Arts Building, at the center, and the tall Barker Brothers Building, to the right, remain standing. USC Digital Library. Lady Killer (C) 1933 Warner Bros. HAROLD LLOYD images and the names of Mr. Lloyd’s films are all trademarks and/or service marks of Harold Lloyd Entertainment Inc. Images and movie frame images reproduced courtesy of The Harold Lloyd Trust and Harold Lloyd Entertainment Inc.
Vintage photos from the Los Angeles Public Library, the USC Digital Library, and color views Google Street View (C) 2014 Google. A view of the Barker Brothers Building. This entry was posted in James Cagney, Pre-Code and tagged Arnold Building, Barker Brothers Building, Bible Institute, Broadway Tunnel, film noir locations, Fine Arts Building, Gates Hotel, Hall of Justice, Harold Lloyd, Hollywood, Hotel Wilcox, James Cagney, Lady Killer, LAFD Engine Co. 28, Los Angeles Historic Core, Mae Clark, Never Weaken, Pre-Code, Richfield Building, then and now, Vine Street, Warner Bros., Wilcox Avenue, Wilshire Boulevard. Bookmark the permalink. Nice work, as always. I haven’t seen this film (yet), but it’s nice to see the Santa Fe depot make an appearance in yet another film! Wih keren banget sob. Salam dari Indonesia. Great work in tracking all these locations. Thank you so much. My current post matches Cagney and Keaton. I love your attention to detail – incredible to think about the history that’s hidden behind everyday facades! Awesome post and awesome website – glad to find it through this blogathon! 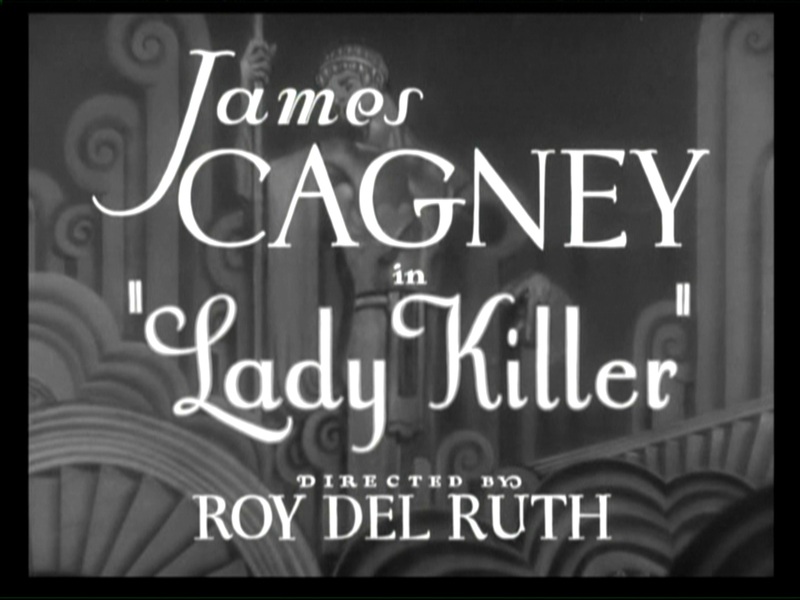 Ladykiller is one of my favorite cagney movies. It is so interesting to see pieces of los angeles in this film. I just assumed it was filmed on the famous warner bros. lot. Wow, it must have taken you a lot of time and effort to put this post together! I’m very surprised with your deep research and I surely learned a lot in this post, thanks. As always, this is insanely meticulous. Thanks for putting all this effort in!